Reno weather has finally gotten much more sunny and much less rainy. I don’t really quite understand what’s happening but the rain was non-stop for like, 2 weeks. At this point, I’m not sure why I’m even surprised with crazy Reno weather. One time a few months ago I walked into the grocery store in 80 degree, completely sunny weather and walked outside to a blizzard. It may not have been quite that dramatic, but it was pretty close. Anyways, that’s typical Reno weather. Welcome to Northern Nevada! Although I have loved the constant rain, cool weather, and cloudy skies, I’m also really excited for it to clear up so that I can go to Tahoe and lay on the beach next weekend! I’ve heard it’s going to be in the 70s and sunny. Being an OG Vegas girl (where you barely wear clothes from mid-May to mid-August), I’m going to need to wear a swimsuit very soon. Although I definitely consider myself a Renonian at this point in my life, I can’t completely get away from that part of my upbringing. Anyways, to celebrate the warmer weather, my friend invited me to go to a BBQ that her friends are hosting. 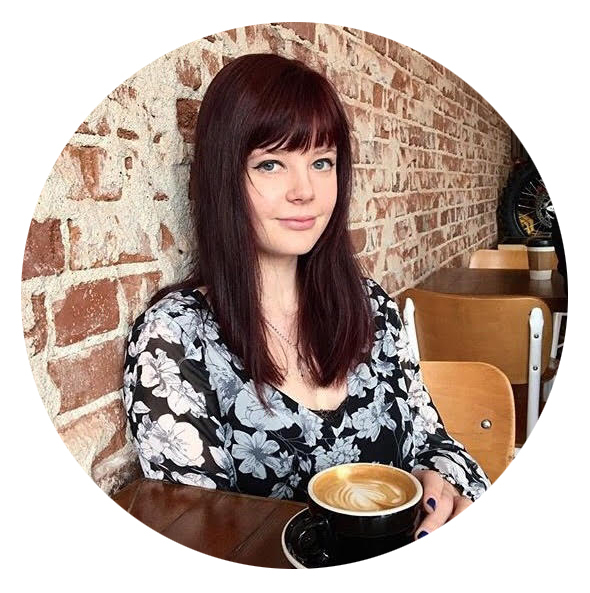 To feel like I contributed in some sort (and since I feel the incessant need to please people), I decided to make one of my family’s favorite recipes. To be honest, I’m not really sure where this recipe came from, but I know my grandma has been making it for forever. We make it quite frequently in the summer, which is why it’s definitely my BBQ staple item. The recipe itself seems a little odd. It is. I may have even used the adjective “ghetto” to describe it before. But it’s soooo good, and you definitely need to make for your Memorial Day BBQ. Heat oven to 350* F. Spread almonds and sesame seeds evenly on a baking sheet. Bake for 5-8 minutes, or until nuts and seeds are evenly toasted. Cool. 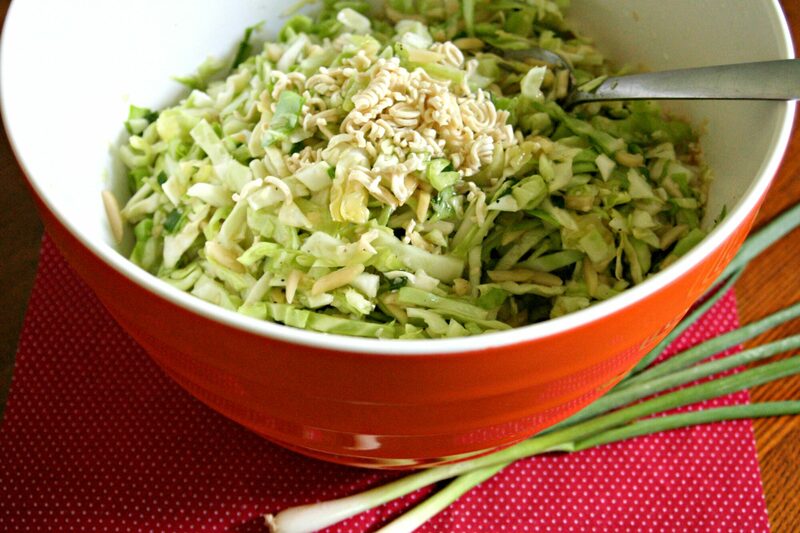 Combine shredded cabbage, green onions, almonds, and sesame seeds in a large salad bowl. Set aside. Combine dressing ingredients until smooth. 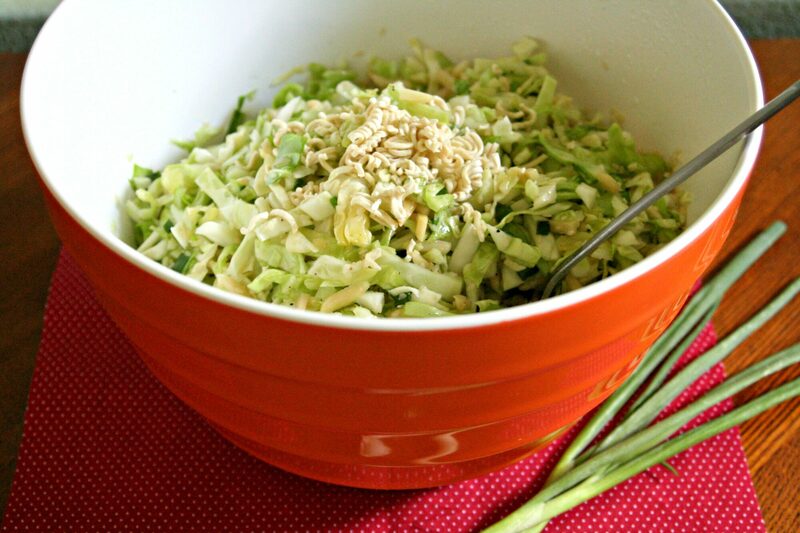 Toss dressing with salad, cover, and refrigerate for a few hours to marinate cabbage. 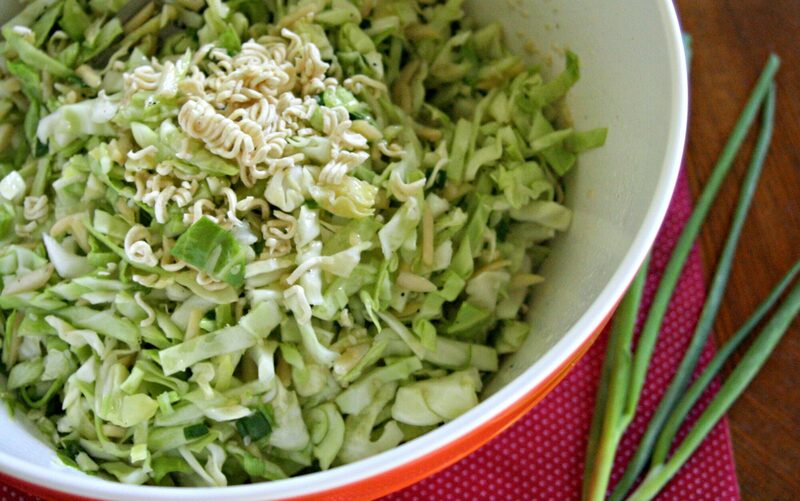 Right before serving, crush Ramen noodles and toss with salad. Serves about 20. Have a wonderful Memorial Day weekend! Thank you to our amazing troops, past and present, who have fought for our freedom. We are so, so grateful.